Yes, even happy housewives have days that don’t go as planned, and yesterday was one of those days for me. It started out with the mild annoyance of not having any milk for my morning cereal and we didn’t have eggs, so we didn’t really have anything for breakfast. 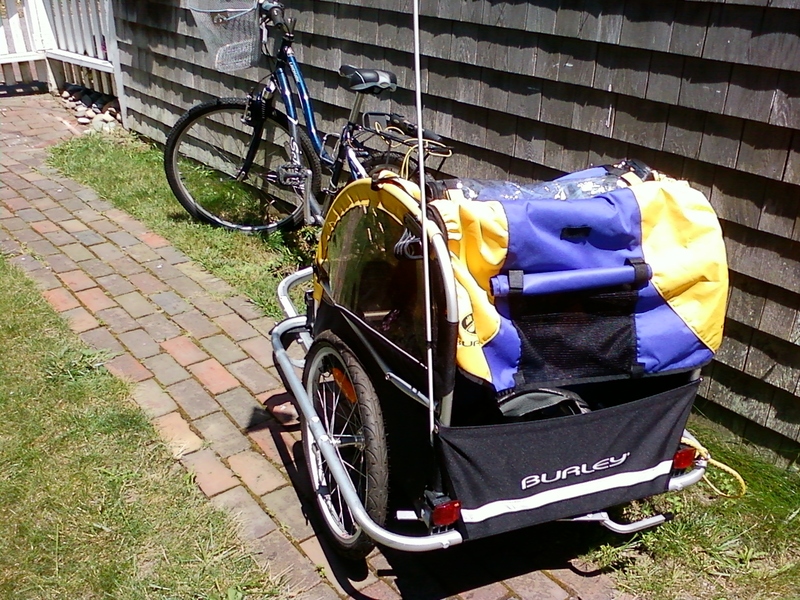 But, that wasn’t a big deal, because yesterday was grocery day and I was excited to try out my new bike trailer. 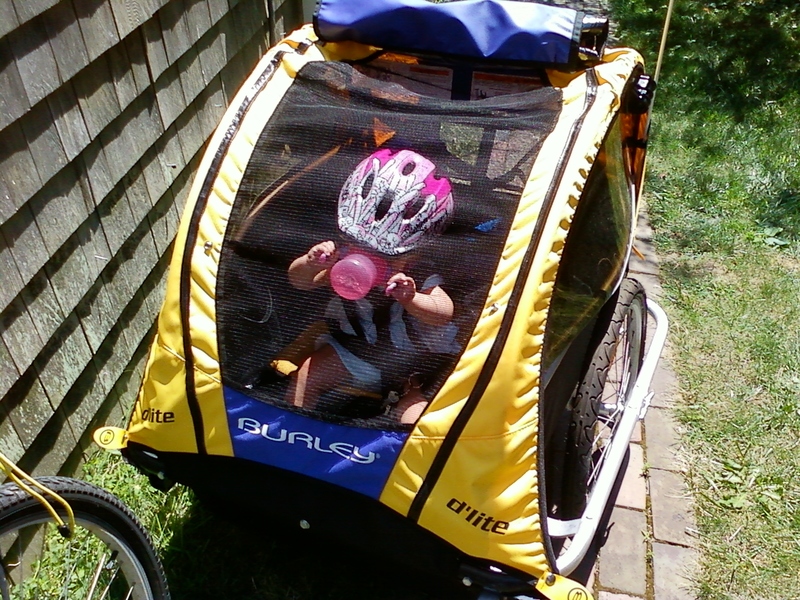 So, we went out into the yard after a few failed attempts at getting Nora to take her morning nap, and I set to work tuning up my bike (it’s been a while since I rode it) and hitching it to the trailer. 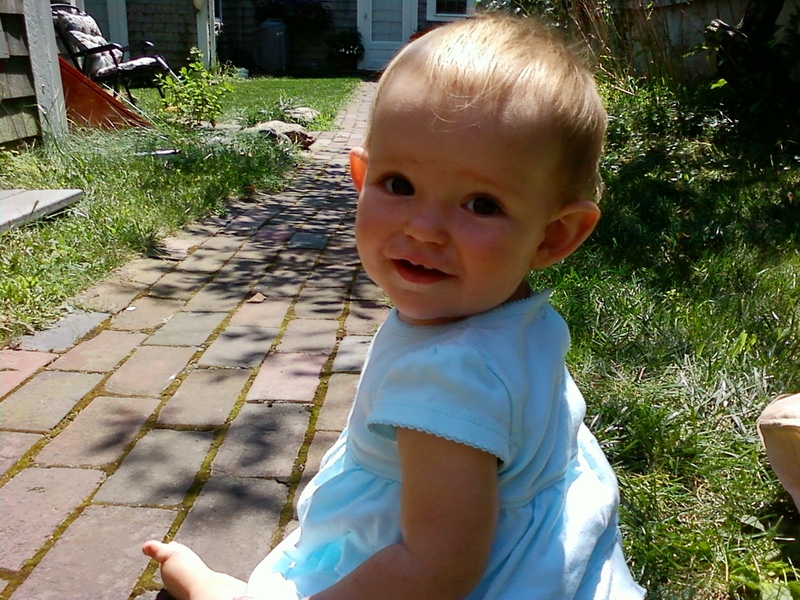 Nora was pretty good about just sitting in the grass and watching me work, even though I could tell she was tired. She even was good-natured about going in the trailer. And didn’t seem to mind the helmet too much. But then after getting her all loaded up, I realized there was no way the trailer was going to fit through the gate, so I had to take her out, unhook the trailer so I could lift it over the fence, and start over. 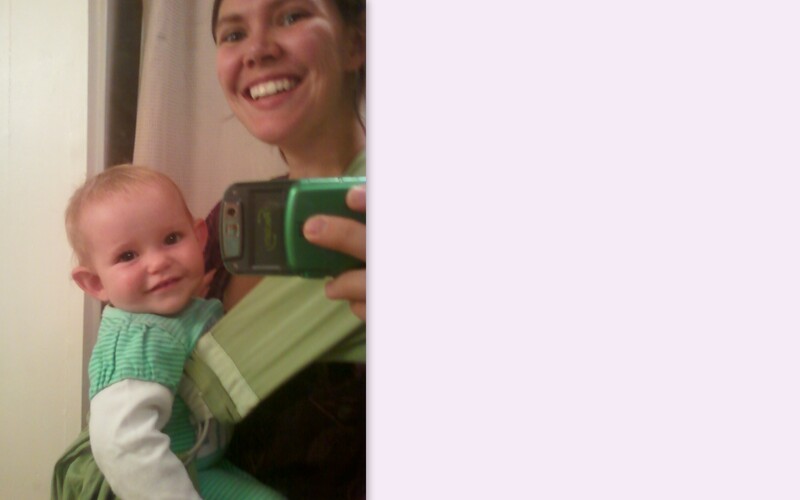 Second time around, she wasn’t too thrilled about going back in, but a sippy cup with some water helped. Finally we got going and I made it several blocks before she started crying. 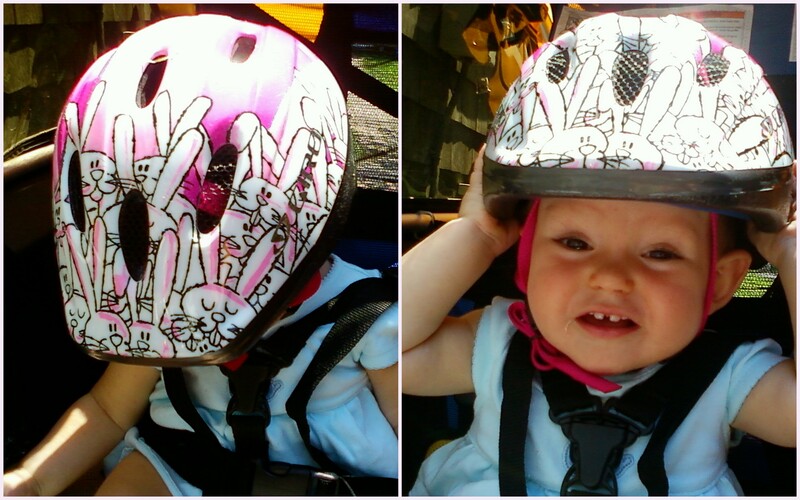 Turns out, she’s still a little too small for the straps, so she slumped down, which made her helmet scoot down, which freaked her out. We were far enough away from home, that I couldn’t carry her and walk the bike, which meant after some time out of the trailer to calm down, she had to go right back in for the trip home. She screamed all the way. 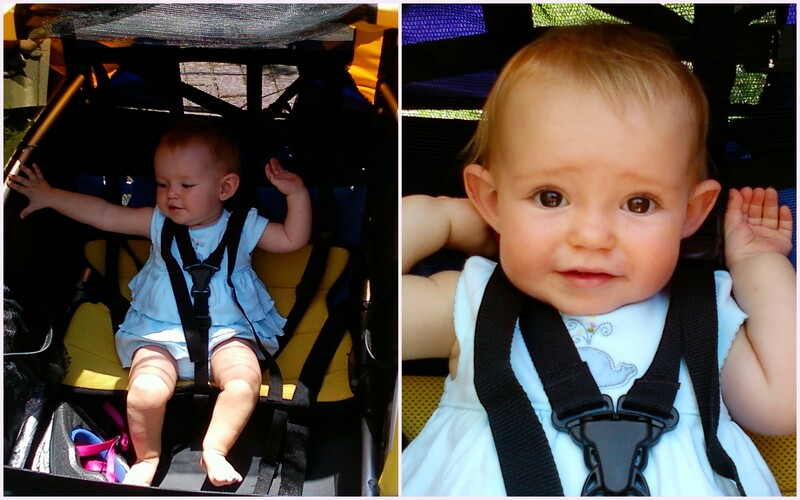 It was like I was torturing her, which wore both of us out. She nursed to sleep at home, but since it was one of those days, I had a hard time getting things done at home while she slept. It would have been the perfect time to remember that with kids, things don’t always go as planned, but since I was having one of those days, I wasn’t really in line with that kind of thinking. And when she woke up, things went from disappointing to downright annoying. To add to my mama-guilt (because she woke up yesterday covered in spots from something we let her eat), after nap she crawled off the bed. It wasn’t as bad as her nose-dive to the garage floor while we were moving, but it still made me feel bad. And when we finally went to the grocery store at 5:00, I got through the register only to realize I had nothing to pay with. Ugh. Despite the blah and annoyance that was yesterday, I always try to remember that there’s good stuff, too. And there was. 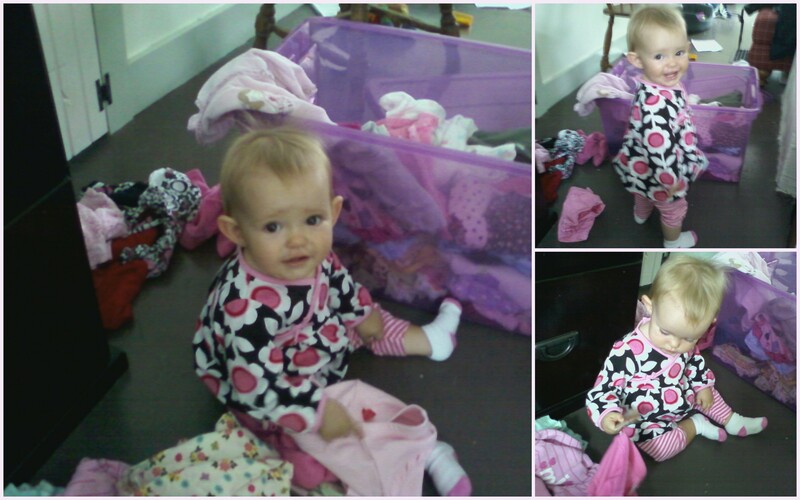 Like, we finally got out the nine month clothes. Which Nora enjoyed sorting – and look at her standing next to the bucket with only one hand! They’re still a little big and I kept out most of the 6-9 month clothes, because they still fit too, but it’s fun to have something “new” for her to wear. 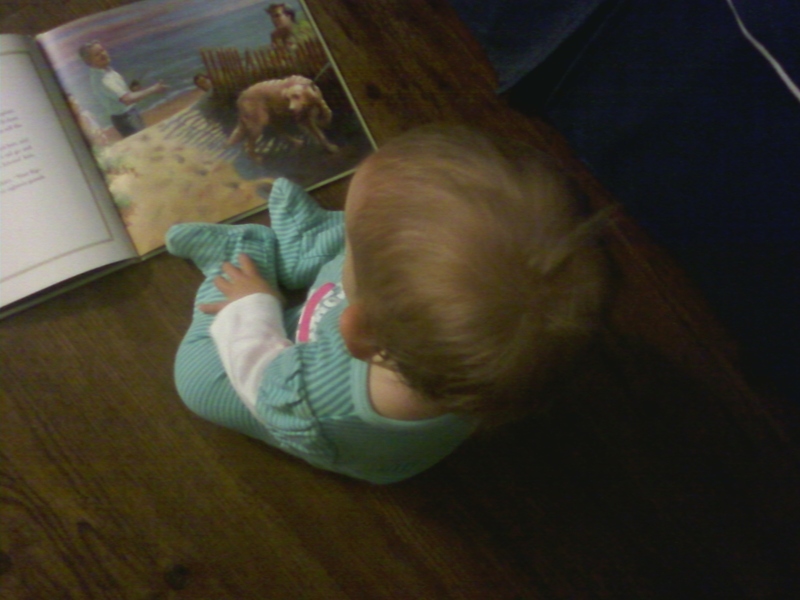 And I love that she “reads” books now. 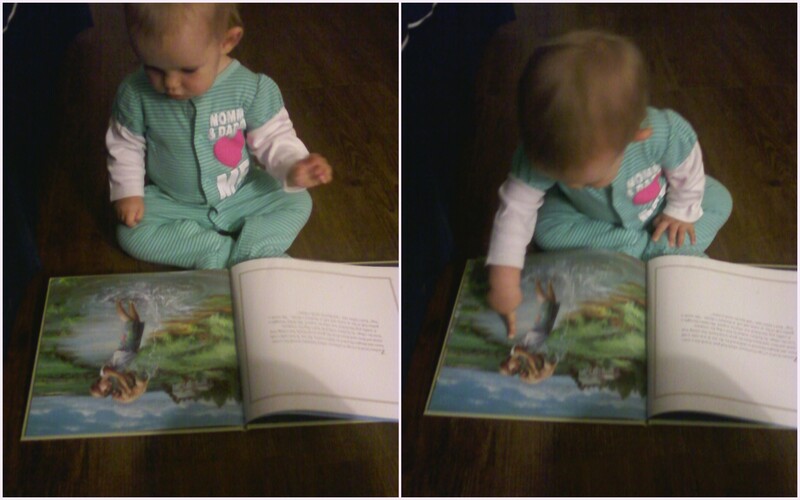 She likes to turn the pages and point to things and talk about them. It really makes me smile. and take a walk into town. Never mind that it’s after bedtime and there are dishes that need to be washed – sometimes all you need is a little fresh air and a baby snuggled tummy to tummy, to remember that tomorrow brings a whole new day. so true! it was useful for me to read this on this day in particular. I’m glad. 🙂 It’s a lot easier to have perspective the day after. Ughh those days are the worst! Happens to all of us. 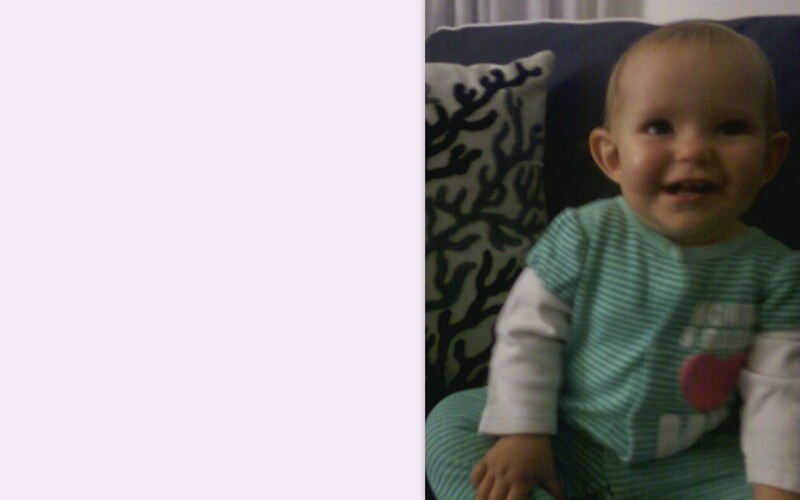 Love all the pictures of Nora she is just sooo precious!!! Sorry the bike trailer didn’t work out I know how excited u were about it! She love it soon enough tho. She looks SO MUCH like Chris in that last photo! !